Alison Bertone, a Malden native, has been a physical therapist in the outpatient orthopedic setting for 13 years. She graduated from Boston University in 2006 with a Master of Science in Physical Therapy. 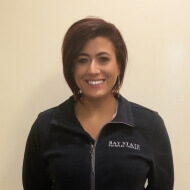 In 2009, she joined the Bay State Physical Therapy team and currently serves as clinical manager in the Malden office. Over the course of her career, she has treated a variety of orthopedic and sports-related injuries using up-to-date manual interventions, therapeutic exercises, and aquatic therapy. However, Alison’s passion lies in the area of dance medicine, specializing in the evaluation and treatment of dance-related injuries and surgeries as well as readiness-to-dance screenings and pointe shoe assessment and fittings. While in graduate school, she completed her clinical education experience at the Harkness Center for Dance Injuries in New York, one of the most prestigious physical therapy clinics specializing in treatment and advancement of dance medicine. In addition to her academic studies in dance, she brings over 35 years of classical ballet training and other dance genres into her practice, having danced and performed with well-known companies including Northeast School of Ballet, Jose Mateo’s Ballet Theatre, and Jeannette Neill Dance Studio, and Rainbow Tribe. Alison believes that her experience as a dancer both in the studio and on stage, combined with her clinical experience, has given her better insight into not only the physical but also psychological impact an injury can take on a dancer and focuses on the best ways to allow the individual to keep dancing while rehabilitating. Aside from management and direct patient care, Alison is a certified clinical instructor through the American Physical Therapy Association (APTA) and has been teaching doctorate level physical therapy students from various colleges for over 10 years. Her desire to teach the next generation of physical therapists, as well as provide her patients with the best care possible, drives her to constantly seek out her own learning opportunities, attending numerous continuing education courses and remaining an active member of the APTA, International Association of Dance Medicine and Science (IADMS), and Performing Arts Medical Association (PAMA).